What a perfectly wonderful seasonal card. I love shakers, especially when they features cute little guys like this! This is so sweet, Doni! I love that you used an egg shape for your shaker - and that bunny is too cute with his heavy egg!! I'm tellin' ya girl ... YOU are the shaker card queen! This is totally ADORABLE! Well done! 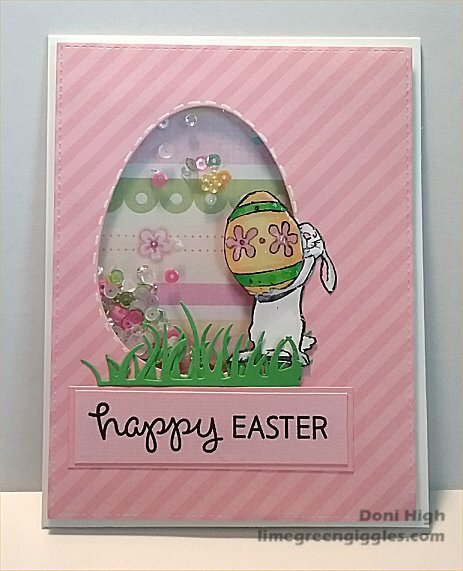 Very sweet card, Doni and i like the soft spring colors. Great take with the Shaker Challenge.